Pimatic Plugin for Johnny Five, a Robotics and IoT programming framework. your Raspberry Pi. Generally, it is possible to use multiple boards at the same time which may be local boards, i.e. the host running pimatic or a board attached via USB to the pimatic host, or remote boards connected via LAN, WiFi or some proxy device on the local network. For Arduino, the universal Firmata library is used which implements a protocol for the communication with host computer. 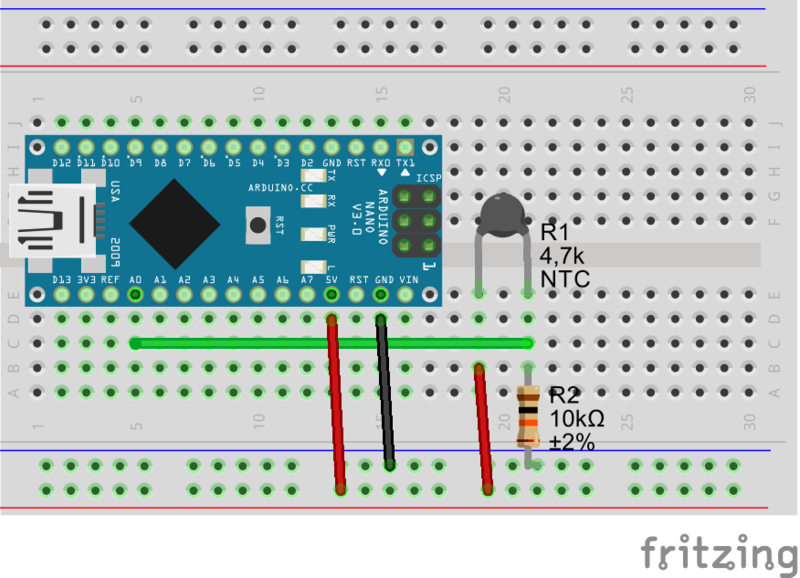 Thus, there is no need to modify the Arduino sketch when new sensors or actuators are connected to your Arduino. Johnny Five also supports a variety of I2C and 1-Wire devices. Support for ESP8266 is experimental at the moment as it requires the "esp" development branch of Firmata. The OLED and LCD display devices are incomplete and, thus, should not be used. They won't do anything useful anyway. Board-support has been tested with "arduino", "raspi-io", "particle-io", "etherport" and "expander" board types. Support for "etherport-client" and "esp8266" is experimental. If you like this plugin, please consider ★ starring the project on github. Contributions to the project are welcome. You can simply fork the project and create a pull request with your contribution to start with. The plugin currently supports Arduino, Raspberry Pi boards, and tethering. More boards can be added on request. The Johnny Five project provides a detailed list of supported platforms with detailed information on supported features and how to set up the board. a remote board connected via etherport. The configuration for a board is an object comprising the following properties. "etherport" - works for Arduinos with ethernet or wifi shields, a software relay to integrate a remote Raspberry will be provided soon. The address needs only to be set if an I2C address other than the default address is used. Devices must be added manually to the device section of your pimatic config. For pin assignment conventions see the document on pin naming. JohnnyFiveSwitch is based on the PowerSwitch device class. You need to provide the address of the output pin. The device is mapped to a JF "digital output" Pin. JohnnyFivePwmOutput is based on the DimmerActuator device class. You need to provide the address of the output pin. The device is mapped to a JF Led. JohnnyFiveRgbLed is based on the DimmerActuator device class. You need to provide the address of the output pins for red, green, and blue. The property isAnode is used to specify whether the LED has common anode or cathode. The device is mapped to a JF Led.RGB. pins Object The pins assigned to the RGB LED, defined by an object with the following properties. JohnnyFivePresenceSensor is a digital input device based on the PresenceSensor device class. You need to provide the address of the input pin and the boardId. JohnnyFiveContactSensor is a digital input device based on the ContactSensor device class. You need to provide the address of the input pin. The Button Device is a digital input device based on the ContactSensor device class. You need to provide the address of the input pin. The Relay Device represents a single digital Relay attached to the physical board. You need to provide the address of the output pin controlling the relay. "NO", Normally Open: When provided with any voltage supply, the output is on. The default mode is LOW or "off", requiring a HIGH signal to turn the relay off. "NC", Normally Closed: When provided with any voltage supply, the output is off. The default mode is LOW or “off”, requiring a HIGH signal to turn the relay on. The Temperature Sensor is an input device based on the TemperatureSensor device class. It currently supports 4,7k NTC thermistors ("TINKERKIT"), various I2C sensors, and the DS18B20 1Wire sensor. Depending on type of sensor different properties are required. If you don't have the tinkerkit shield, here's a wiring sketch for the thermistor. The 'johnny-five-icon' files have been created with Inkscape using artwork by Mike Sgier published as part of the Johnny Five project. Copyright (c) 2015-2017, Marcus Wittig and contributors. All rights reserved. boolean Debug mode. Writes debug messages to the pimatic log, if set to true. boolean If true, invert the contact states, i.e. 'on' state on LOW. boolean If true, invert the presence states, i.e. 'present' state on LOW. boolean If true, invert the button state. string The I2C address. If controller is an I2C device and address is not provided the device-specfic default address applies. string The I2C controller. If omitted the parallel interface will be used. string The comma separated list of pins used for the parallel interface. string The pin driving the backlight for the parallel interface.